Opening day at the ski hill is only a month away and Fresh Sports is hosting the 6th annual FRESHTIVAL, Canada&rsquo;s Premiere Freeski Film Festival to get you amped up for the new ski season. 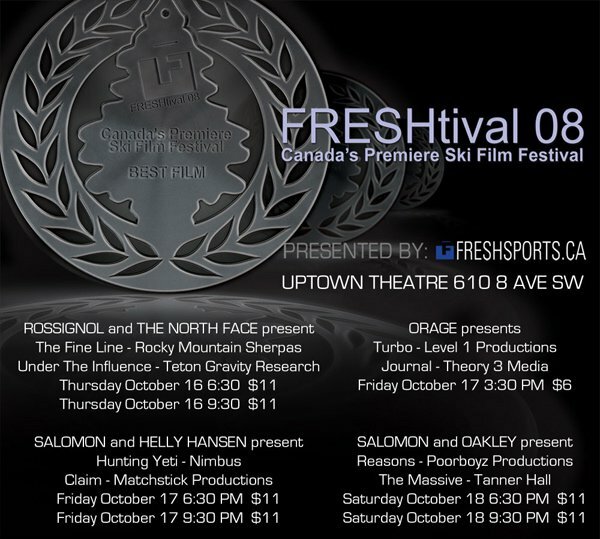 The Freshtival is North America&rsquo;s longest running free ski film festival and premieres the top eight newest and most exciting ski movies of 2008/2009, screened at Calgary&rsquo;s Uptown Theatre October 16 - 18, 2008. Come down and meet skiing superstars, legend Seth Morrison, the godfather of new-school skiing Mike Douglas, big mountain shredders Marc Abma and Dana Flahr, local heros Eric Hjorliefson, Chris Rubens and Rory Bushfield, the new young sensations Kye Peterson and Sean Petit and many more or try to win one of the many prizes from Canada&rsquo;s Premiere Freeski Film Festival, the Freshtival&rsquo;s sponsors. Tickets are available online at http://www.freshtival.ca and at Fresh Sports, 108 10 St NW in Calgary, AB. Freshtival is produced by Fresh Sports, Canada&rsquo;s Premiere Freeski Shop and brought to you in part by Salomon, Rossignol, The North Face, Helly Hansen, Oakley, Smith Optics, SBC Skier and The Resorts of the Canadian Rockies. Fresh Sports has been a trusted name in the freeski industry for the past 7 years and sells the top quality equipment skiers need to enjoy the Canadian Rocky Mountains. Fresh is a large supporter and promoter of the Canadian Rockies&rsquo; ski community and has received international acclaim for being North America&rsquo;s first dedicated freeski store.